I reread this 1981 edition of Burdick’s 1969 book (Moody Press) for a lesson I was teaching on 1 Corinthians. I had forgotten how valuable and useful this small book can be for laymen struggling with the tongues issue. 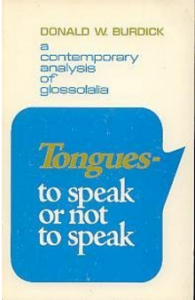 Burdick believes that tongues belonged to the list of miraculous gifts and that miracles passed off the scene at the same time as the office of Apostle. One of the most helpful sections of the book is the one on non-Christian Glossolalia, in which he traces the many religions of the world, that make no claim to Christianity, but also speak in tongues. Also, the last section on possible explanations of modern glossolalia (ecstasy, hypnosis, demonic, psychological, exalted memory) allow the reader to see that such evaluation is possible.